Warendorf is currently in training and will hopefully be coming out at Prix St. Georges in 2011. He has an incredible ability for lateral work and has three expressive gaits but he especially shines in his walk work. 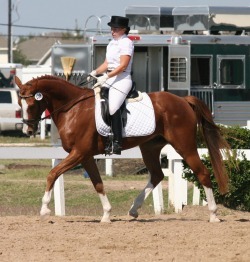 SMF has owned Warendorf since he was a yearling and started him under saddle in 2005 and has been showing him in recognized dressage shows ever since. He has comepted through fourth level with scores in the 60s. Waren and Jenna spent October training with JJ Tate in Chesapeake City, Maryland!